The #SIA2018 is going to be extending these professional visitors an even warmer welcome this year! More than 30,000 professionals filed through the aisles of the Porte de Versailles Exhibition Centre during the 2017 show. 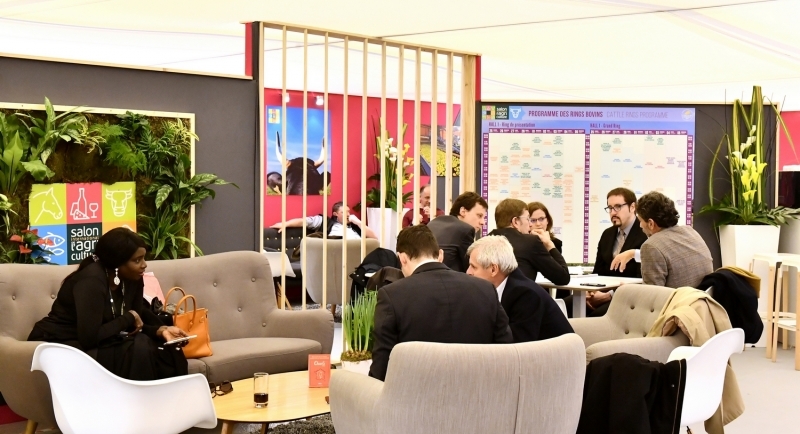 The Paris International Agricultural Show is going to be extending these professional visitors an even warmer welcome this year, with special events, themed practical workshops and dedicated visit itineraries. The professionals' village is getting bigger! The Professionals’ Village will be in Hall 1 and will be hosting a number of events and features for professional visitors, including demonstrations of agricultural machinery and equipment, services and genetics. Created in 2017, the Village has proved extremely successful. And it will be even bigger this year with a number of new brands, such as manufacturer CLAAS France and Agriest, the Eastern-Francebased supplier of farm equipment. According to a survey conducted at the 2017 show targeting professional visitors, 60% come to find out what's going on in their sector and 40% come to talk to their colleagues. To meet this need, an eventpacked programme featuring around thirty practical workshops will be on offer in an area just next to the Professionals' Village. Based around a 30-minute format, these extremely practical events have been designed to tackle specific topics and will deal with current issues such as the bioeconomy, animal welfare, the market for organic products and the price volatility affecting agricultural materials. For the 2018 show, the contents of these practical workshops* have been expanded to provide an even broader overview of the agricultural sector. The Paris International Agricultural Show has a number of services available for professional visitors: the International Business Club in Hall 1, a professional visitor guide, two expert itineraries focusing on the plant sectors and the animal sectors, as well as the option to visit the show with a guide. Every year, the Show becomes just that little bit more international. In 2017, 14% of all professional visitors were from abroad*. They visit the Show to find out (or remind themselves) just how rich and diverse French farming is. For 2018, a number of international delegations will be welcomed to the Porte de Versailles Exhibition Centre – mainly from the Adriatic and other southern European countries.